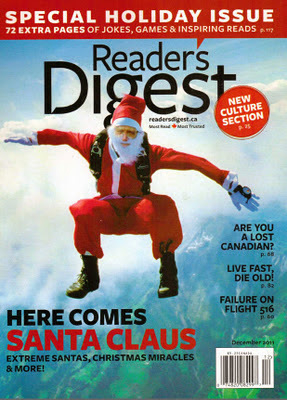 Readers Digest Magazine, features an article about the Lost Canadians in its December 2011 issue. The world's most read magazine has finally featured the story of the Lost Canadians on its front cover this December, 2011! Click here to read more about the article on the Readers Digest website. Written by Drew Nelles, the six page article Lost Canadians: How Unjust Legal Quirks Rob Canadians of their Citizenship, features an interview with Don Chapman, leader of the Lost Canadians and tells the the true life story of several victims, including Guy Vallieres, a Second World War veteran who died in 2009, disenfranchised from his own country. "I cry every day and think about dying," Vallieres was quoted as saying in a 2007 presentation to the Parliamentary Committee on Citizenship and Immigration before he passed away. The article also includes an interview with "Jack" who prefers to remain anonymous for fear it may jeopardize his status. His mother is 93 and he cares for her at home in Atlantic Canada. Another interview with Montreal Rabbi Shneur Rabbin shows the unfairness meted out to Canadians because of legal quirks based on gender or family status that prevent them from claiming citizenship. A side bar contains a list of famous Lost Canadians, including Dan Akroyd, Michael J. Fox, Shannon Tweed, etc. Do you have your own Lost Canadian story? Share it on line and it could appear on the Readers Digest website. Click here to submit your story to Readers Digest Magazine.